GTR Southern rail users with disabilities face delayed journeys or the prospect of no longer being able to board some trains after the company said there was no “cast-iron guarantee” that assistance would be available at all stations, The Guardian reported. The change has been linked to the extension of ‘driver controlled operation’, in which guards are replaced by ‘onboard supervisors’. Southern has admitted it may have to book taxis for disabled travellers who cannot complete their journey because the only member of staff on the train is the driver. Previously there were 33 stations across the Southern rail network where passengers in need of assistance to get on or off the train could turn up and be guaranteed help. According to Wikipedia, Southern Railway ‘operates’ 156 stations. Like other train operators, it has never offered network-wide spontaneous travel for persons of reduced mobility. How could such a facility be provided? It would appear that implementating turn up and go nationwide would, in many cases, require the train driver to assist with boarding and alighting. That would entail changes in equipment and operating procedure, to allow the driver to leave the cab as and when required. HS2 Ltd chairman David Higgins is to become chairman of Gatwick airport next month, leaving the high-speed rail project “with an increasingly occupied figurehead and no permanent chief executive”. Higgins, who also spends time working in Australia as a director of the Commonwealth Bank, will take over from Sir Roy McNulty on 1 January at the Sussex airport. He is paid £240,000 for three days a week at HS2 and is understood to be remaining in post as chair for up to a year, until a replacement is found and as the search for a new chief executive continues. HS2 said the extra work would not affect or conflict with Higgins’s current role at HS2. When he spoke to the House of Commons transport select committee on 12 December 2016, Mr Higgins made no mention of his new Gatwick job. He also omitted to explain that his remarks to the committee, on 17 November 2014, about the relationship between railway speed and capacity, were misleading and inaccurate. In 2013, HS2 Ltd finally admitted that its new line would increase carbon emissions. But on Monday, Mr Higgins told the committee that HS2 was carbon-beneficial (although he had no figures to back that up). [Chair:] Will High Speed 2 result in a reduction of carbon in the environment? [Sir David Higgins:] It should, because it is a very carbon-efficient way of moving people. The railway can move 18,000 people an hour so it is very carbon efficient in terms of delivery. I remember seeing the stats. If you compare trains with buses — obviously it depends on the occupancy of the trains themselves — they are much more efficient. [Chair:] What is the latest estimate for carbon reduction? [Sir David Higgins:] I do not know that. I do not want to tell you a figure off the top of my head. I will get my experts behind me to write to you about that. [Chair:] We would like to have that information, please. An internal HS2 Ltd document on aspirations for ‘level boarding’ from platform to train stated “there are no obvious grounds” for a European ‘Technical Standards for Interoperability’ derogation. But when asked on 12 December if HS2 were seeking a derogation, Mr Higgins replied, ‘Yes’. [Graham Stringer MP:] There was a report in The Sunday Times yesterday that European regulations mean that the platform heights on HS2 will make it difficult for disabled people. Is that story true? [Sir David Higgins:] I saw the article. The answer is that we are going to build platform heights between 1.1 and 1.2 metres, which will allow full access for disabled people. We have to get regulation exemptions from the current ones, and we are having that whole discussion with the European Commission. It does not make any sense whatsoever to build platforms at a low height when we want speed of access and proper disabled access to the station. I am really clear where the Government are on this. We want to discuss it with Europe and the Commission very carefully, but we do not want to build a platform height that does not deliver proper access. We will never get the turn-round times if we do that either. [Graham Stringer MP:] Getting the platforms at the right height effectively depends on getting a derogation from the regulations? The home secretary, Amber Rudd, has defended proposals to require companies to publish the number of international staff they employ, the Guardian reported. The proposal has been criticised by several high-profile business leaders, including the British Chambers of Commerce (BCC). Rudd, who has set out a consultation paper on how to encourage businesses to hire British staff, denied the lists were intended as a “badge of shame”. “We should be able to have a conversation about immigration, we should be able to have a conversation about what skills we want to have in the UK and whether we need to go out of the UK in order to get them to boost our economy and I don’t think we should have a situation where we can’t talk about it,” she told BBC Radio 4’s Today. Is collection of data about the numbers of people on zero-hours contracts a “badge of shame”, or useful information for debate and public policy? If data about international staff employed is ‘xenophobic’, then presumably, data about numbers of male and female staff is ‘misandrist’ or ‘misogynist’. And figures about differently-abled staff must be ‘disablist’. Special interest groups, such as chambers of commerce, and the Confederation of British Industry, would prefer that there was no information about the number of female staff, number of people on zero-hours contracts, or number of foreign workers. It seems unlikely that companies will be required to publish the number of international staff they employ. It could be quite embarrassing for the government. For example, London’s Crossrail project has been promoted by the government on its ‘UK job benefits’. But what proportion of Crossrail’s workforce are ‘UK workers’? Claire Perry, head of marketing for Hitachi Rail, rail minister, made the following speech to mark the arrival, at Southampton docks, of the first IEP train in the UK. And thank you Peter Lavelle (Depot Manager Southampton Dock) for your kind introduction. It is an absolute pleasure to be here today (12 March 2015). Before we head over to the quayside to see the train unloading from the ship, I would like to take this opportunity, on behalf of the government, to thank Hitachi Rail and Agility for all the work they have done. And for getting the first train to the UK on time and on schedule. Given Hitachi’s reputation for reliability, we expected nothing less! Let me tell you why I’m so excited today. First, because these superb new trains will be transformational for passengers on two of our busiest and most important rail routes to the north and the south west. A smart and business-friendly environment in which people can work. The trains have been designed to offer flexible and fantastic new catering facilities. Every single pound of investment is going into improvements that passengers will be able to see and feel. But these new trains are not just good news for passengers. They are also fantastic news for Britain. And that’s my second reason for celebrating today. The benefits will be felt all over the country. But particularly in the north east. Where 730 new jobs are being created at the Newton Aycliffe factory over the next 5 years. This region – of course – played a pioneering role in the development of the early rail network. 190 years ago, the Stockton to Darlington line was the world’s first public railway to use steam locomotives. So the railway is coming home to Newton Aycliffe bringing back rail jobs to the north east. And also building a new centre of rail excellence in the area. Among the suppliers to IEP are Durham-based window company Romag. And Newcastle-based Nomad Digital, which will provide on-board servers. And many more jobs will be created across the country. 72% of the parts, systems and services that could have been sourced from the UK actually have been. Luccini, based in Manchester, is providing the wheel-sets. And Knorr Bremse, a company based not far from my constituency in the south west, is supplying the braking systems for the IEP trains. In fact I visited them recently. All in all, this is worth billions to British businesses. I know that many more IEP suppliers are here today – too many to mention – but I’d like to thank you for being part of the project. Hitachi Rail has also moved its global HQ to London, which is yet another sign of confidence in our flourishing rail industry. The train arriving today is tangible evidence of our rail renaissance. Of unprecedented investment in our railway. After decades of neglect and underinvestment, we have got a huge programme of modernisation underway, the biggest for over a century. That’s because rail is a vital part of the government’s long-term economic plan. Growth cannot happen without investment in our infrastructure. It’s why we’re spending £38 billion maintaining and improving the network between 2014 and 2019. It’s why we’re investing in Crossrail, HS2, the Northern Hub, and electrification. And it’s why we are fully behind Hitachi as it embarks on this massive programme. There are a few more essential thank yous. Of course, thank you to Hitachi and Agility. Thanks also to Wallenius Wilhelmsen for safely transporting the first train here. Thanks to the Train Operating Companies for their support and input to the design. And I would like to acknowledge the very many passenger groups and industry representatives here today who have also contributed to the IEP project. I would also like to thank the Department for Transport and all the policy officials, some of whom are here today, for the tireless work they have done (and continue to do) in partnership with you all ensuring these exciting InterCity Express trains go into passenger service as planned on the Great Western and the East Coast main lines. The only thing I find uninspiring about the train is that name – IEP. I don’t know how you feel, but it doesn’t really capture the excitement or romance. So can I challenge you to come up with a new name. Something that reflects their sleek design. What they’ll be like to travel on. How they’ll look speeding passengers across the country. What they’ll do for the UK. 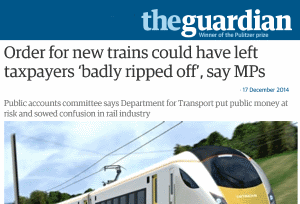 I may not be Rail Minister to decide on the best name….. But I will always remember today. The start of a new era for rail travel in the UK. “72% of the parts, systems and services that could have been sourced from the UK actually have been.” So what does that mean? The UK can’t produce aluminium extrusions, bogies, traction motors, gangways, doors (…etc)?